This book was first published in the mighty Soviet Union in 1972. It is NOT a basic book to learn how to play chess or how to improve your game. It is a story book with the chess pieces as a background. It is suitable to be read to children who are interested in the game. The basic moves and some simple mates are provided, but mostly it is a story book. The great thing about this book is the art work and design. The book is filled with drawings of kings, elephants, knights on horseback, boats and soldiers. The front and back cover provide examples of this. There are 63 full color drawings in the original book. 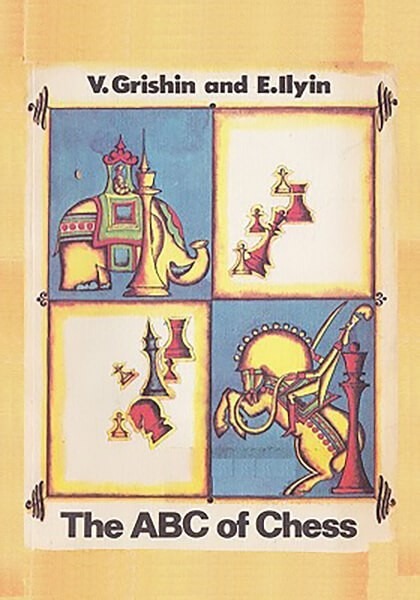 The presence of elephants and boats in this book is because the chess piece we call the bishop is called the elephant in Russian and the piece we call the rook is called the boat in Russian. This book was originally published in the Soviet Union as a 4-color book. Almost every page contained colorful drawings of chess related themes such as armies in battle. There are 63 full color drawings in the original book. Unfortunately, due to the high cost of publishing a book in four colors, the 63 drawings in this book are reduced to grayscale. The original 4-color version is still available online, but only as a used book.